Triple LP version. Destroy All Monsters are known by some for their role as a bastion of resistance of Detroit's rock; for being, during their second period, the band in which Ron Asheton would reappear. For others, they are a pivotal reference point in the copious but relatively unknown avant-garde underground from the same city, after Thurston Moore and Byron Coley dug up their first recordings in 1996 and the original line-up reunited. 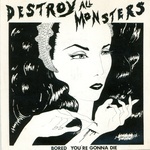 Destroy All Monsters comprises two complementary and interconnected poles throughout the saga of the Motor City's music scene, from the University of Michigan's Cooperative Studio for Electronic Music to The Stooges, through to the White Panther Party. In its two incarnations, the experimental -- led by Cary Loren, Jim Shaw and Mike Kelley -- and the high energy one -- with Asheton and Michael Davis from MC5, both featuring the phantasmagorical Niagara in the role of doped-up priestess, Destroy All Monsters are the object of one of the most devotional cults of America's cultural underground, as testified by their abundant artistic and record production. Hot Box 1974-1994 is the first anthology to bring together the best outcome of those two hemispheres, including much unreleased material. Includes a generously-illustrated booklet featuring photos and artwork never seen before. All tracks have been remastered from recently discovered tapes. "Grow Live Monsters is a selection from short home-made no-budget 8mm, super 8 and 16mm film fantasies made between 1971-1976. Most of the films revolved around a group of friends and the wall of noise they would create in basement cellars and in live performance. 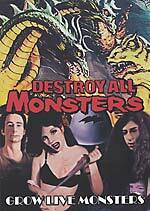 This was Destroy All Monsters, one of the most avant-garde 'bands' of all time. 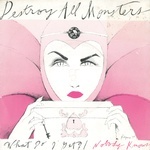 Featuring artists Niagra, Jim Shaw, Corey Loren and Mike Kelley, Destroy All Monsters is like nothing else. Ever. Psychedelic meets noise meets high and low brow art in a Midwestern blender. Say goodbye to your retinas." DVD Contents: "Grow Live Monsters (1971-1976)" - The early films of DAM; "Shake A Lizard Tail or Rust Belt Rump" - Montage of late-night TV adverts, techno club dancers, and Z grade monster clips; "Monsters Redux" - Outtakes, concert footage, band memorabilia, and photos; "DAM Invades Seattle" - Performance footage from Seattle, 2000; "Hometown Horrors" - Band photos and production stills. Total running time: approx. 145 minutes; 5:1 Surround Sound. NTSC format, region 0.